A few weeks ago I got an email from Anthony, who lives in Illinois, saying he is coming to Pittsburgh for a conference and wants to visit Tazza D’Oro while he is here. Anthony found us on the internet through some research about coffee in Pittsburgh. We emailed back and forth and set a date for his visit. Anthony has a day job as a Professor of Philosophy at Southern Illinois University, and is a huge coffee aficionado and serious home barista. On Saturday, Anthony found his way to Highland Park and Tazza D’Oro for a taste of some Pittsburgh brewed coffee and espresso. We decided to hold a coffee cupping for him and before I had a chance to set up the coffee, Braden had already pulled several espresso shots for Anthony to try. So here is the small world story: I set up the coffees for our cupping – Ethiopia Harar, Guatamula Finca El Valle, Costa Rica La Minita and the great Panama Esmeralda. I was really excited for Anthony to cup the Esmeralda but when he saw the La Minita he said “that’s one of my favorites and I cupped that coffee with Oliver”. Oliver? Batdorf and Bronson in Olympia, Wa? Yep! As it turns out, Anthony is originally from Portland and has some family in Oly. He and his family spent some time in Oly and with Oliver at Batdorf talking and tasting coffees – small world and pretty damn awesome too! After we cupped the coffees and made a French Press of the Panama Esmeralda, Braden gave Anthony a quick lesson on our La Marzocco espresso machine. I tasted a lot of good shots and witnessed some good looking steamed milk all from the “home barista”. 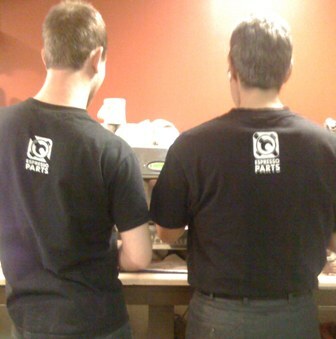 The other piece of the small world story is that both Braden and Anthony happened to be wearing their Espresso Parts T-shirts. 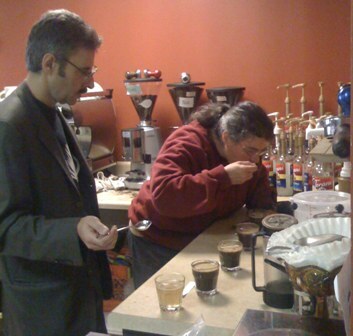 Espresso Parts is located in Olympia and it’s where we purchase a lot of our espresso gear and gadgets. Our visit with Anthony was another incredible “coffee experience” day. 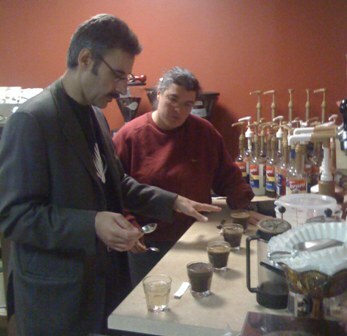 Anthony, thank you for your visit and for giving us the opportunity to share our passion for coffee with you. Stay in touch and come back soon!